You would be forgiven for thinking you had just walked into Ron Burgundy’s apartment if you had these new Rich Mahogany guitar models in your home. 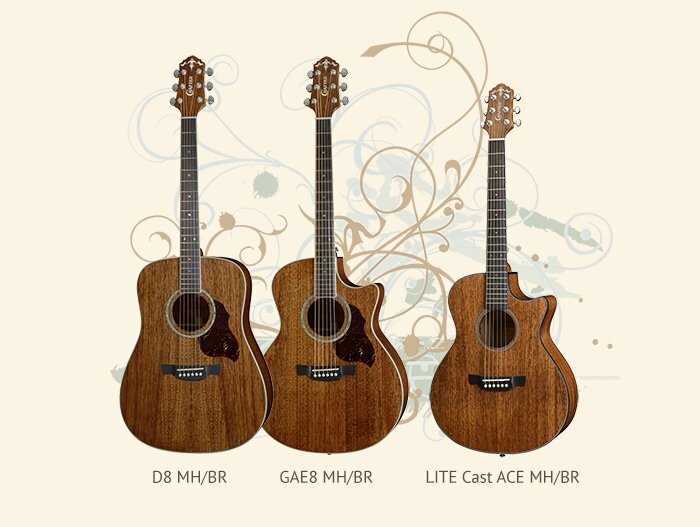 For 2013, Crafter have introduced three new models to the Crafter lineup in the increasingly popular Mahogany finish. Two models in the MAHO TOP range include the D8 MH/BR and GAE8 MH/BR, these are Dreadnought and Grand Auditorium (Electro) models in a gloss finish with scratchplates. Satin finish guitars in the range are still available without the scratchplates. The new LITE Cast range also includes a new Mahogany cutaway model with the Acorn VTA PreAmp and Cable Pickup, to complete the series. As well as the new Mahogany models, a new addition to the 9 Series in Maple has been added in the form of the D9 (Dreadnought) which compliments the existing T/TE9 (Orchestra) and GAE9 (Grand Auditorium) models in the range. All of these guitars feature solid Engelmann Spruce tops with vintage Maple backs and sides. NAMM is only around the corner and Crafter are expected to release a brand new Anniversary model plus a couple of new guitars at the show at Anaheim in California, USA.